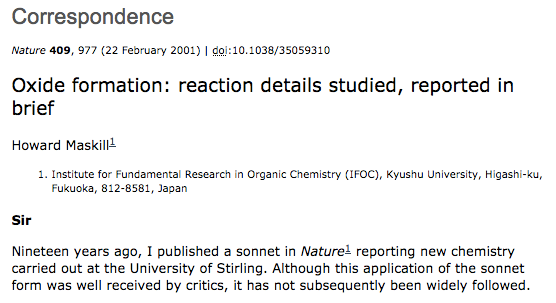 It is, apparently, #WorldPoetryDay (on Twitter at least) and the question of writing a scientific paper in poetry form cropped up again (it does every now and then). 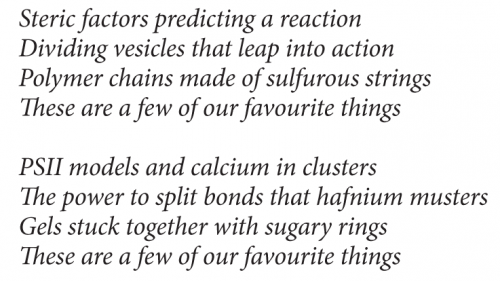 And when it does, I usually end up digging through the dusty folders on my computer to find the few examples of chemistry poetry that I’ve come across over the years. To save me doing that again, I figured I’d just compile them into a blog post (and if you do know of any more examples, please point me to them in the comments below). The article is written in iambic pentameter and there’s an analysis of the whole thing over at the Poetry & Popular Culture blog. 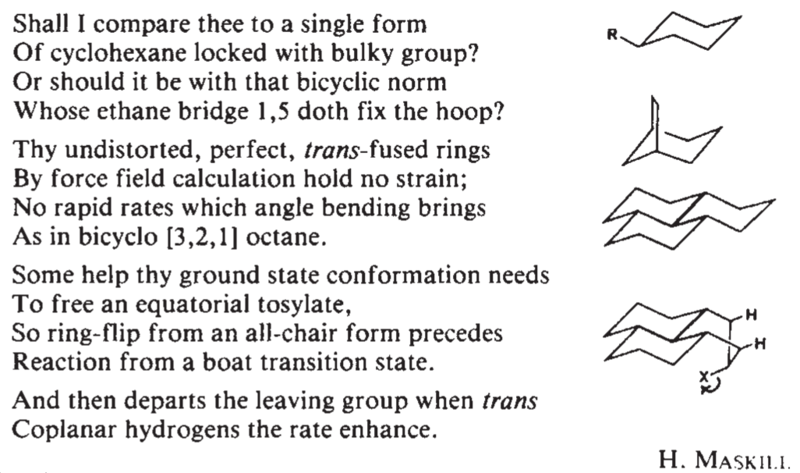 Science in sonnet form just didn’t catch on. Science gets the 5-7-5 treatment. Maskill is not the only poet-chemist out there; Roald Hoffmann, recipient of the 1981 Nobel Prize in Chemistry, is also well-known for his writing outside of scientific journals, including books, plays and poetry. He has been known to combine the two, including this table-of-contents entry in Angewandte Chemie in 2009 (thanks to Neil Withers for pointing this one out a while back). 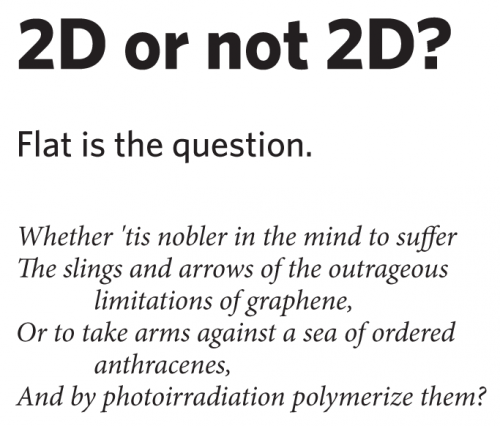 Maybe all TOC text should be written in limerick form? Or maybe not. 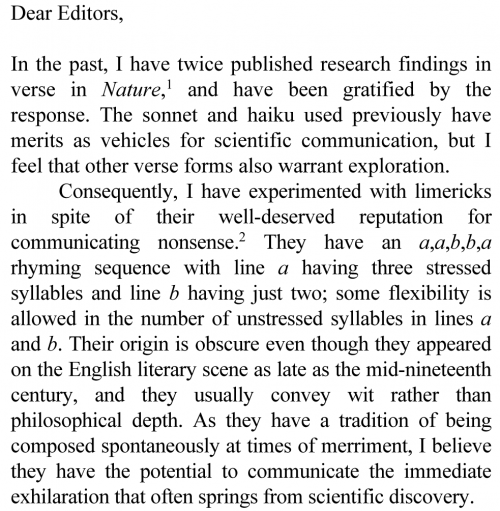 Know of any other scientific papers written in verse? Let me know in the comments! 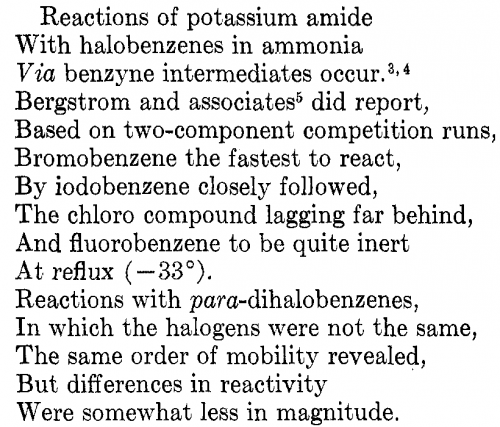 This entry was posted in Fun, History of science, Publishing and tagged #worldpoetryday, chemistry, chemistry publishing, haiku, history of chemistry, hoffmann, iambic pentameter, limerick, literature, poetry, publishing, shakespeare, sonnet. Bookmark the permalink.